What to do in Isla Mujeres? 5 things you can’t miss there! Isla Mujeres is a jewel of the Mayan Riviera: mystic, rejuvenating and even magical, this beautiful place has a lot of things to do and experiences to live! However, there are 5 plans you must include on your agenda. If you’re traveling just for one day to Isla Mujeres, you probably won’t find the time to do all these plans. If you can stay there for 3 or 4 days, it would be perfect to enjoy the basics of the island! You can start in Punta Sur. Rent a golf cart and enjoy the ride along the beach. At the end, you will find a cliff in Punta Sur. Besides places to eat and drink, you can find one of the best spots to take pictures in the Mexican Caribbean. Also, did you know that this is the first point to see the sunlight in Mexico? Don’t miss the stunning sunrises! Once you’ve seen enough, go to Punta Norte. Get your towel out and enjoy the sun and beach on this beautiful beach. But if you have the opportunity, wait until the sunset to admire the landscape. 2. Swim with whale sharks! If you are addicted to adrenaline, forget about parasailing, skydiving or anything else. Take your camera and experience this wonderful moment! Just remember to schedule the tour with professionals that can take care of you during the excursion, which lasts half a day, approximately. Some of the tours that take you to swim with whale sharks also offer snorkeling tours. The most common places to do it are the Manchones reef, the MUSA and El Farito reef. At El Farito, you can literally float with the current and enjoy a marvelous view of fishes, crustaceans, corals and more! On the other hand, there’s the Garrafon de Castilla (not to confuse it with the Garrafon Park). Even though it’s not a secret, it looks like one. You will barely see tourists there and you will find one of the best places to enjoy the underwater wonders. The Tortugranja is a project financed by the government, which oversees the protection of the turtles. A lot of turtles arrive to Isla Mujeres to lay eggs and, in the Tortugranja, they protect them to guarantee their survival. If you’re lucky enough to be on the island in October, you could be part of the release of baby turtles in the sea. It’s amazing! In the city of Isla Mujeres, which is on the continent, you will find one of the most spectacular places to swim with the brightest sea mammal: the dolphin. Dare to know these creatures in a natural habitat! A swim with dolphins in Cancun is the last thing to do on your trip in order to complete your experience of Isla Mujeres. 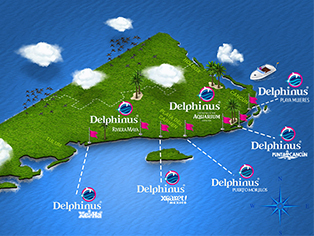 In Delphinus, we have the best places to do this, in order for you and the dolphins to have a nice and friendly encounter! Discover more about our new natural habitat in Isla Mujeres!